Stages upon stages and music everywhere you turn. Yes, festival season is officially upon us. Coachella 2014 and New Orleans Jazz Fest have already come and gone, but there's still plenty of summer music festivals to go around. The scene is heating up, and with more outings planned every year, the U.S. music festival circuit shows no signs of slowing down. So get out that floppy hat and grab your sunscreen and dancing shoes -- because it's time to rock. This newbie festival, which debuted last year, will run over two weekends. On the bill for May are the Decemberists, Modest Mouse, Death Cab for Cutie, Jack Johnson, the Head and the Heart, Jenny Lewis and more. The second weekend will feature Nas, the Replacements, Lorde, Neutral Milk Hotel, the Roots, Girl Talk, among others. Sasquatch, May 23-25: George, Wash. This three-day music festival, held over Memorial Day weekend, takes place at the scenic Gorge in Washington state. Taking the stage in May will be Violent Femmes, M.I.A., the National, Queens of the Stone Age, Kid Cudi and Cut Copy, among others. Bayou Country Fest, May 23-25: Baton Rouge, La. Country stars head to Baton Rouge for Memorial Day weekend -- from George Strait and Florida Georgia Line to Jason Aldean and Eric Church. The Governor's Ball at Randall's Island seems to get bigger and better ever year. The 2014 lineup includes Vampire Weekend, Jack White, Outkast, the Strokes, TV on the Radio, Foster the People, Spoon, Neko Case, Damon Alborn, J. Cole, among dozens of others. Bonnaroo, June 12-14: Manchester, Tenn. It's almost always steaming hot in Manchester over Bonnaroo weekend, but that doesn't stop the crowds from pouring in to check out some of the hottest bands and singers around -- and some veteran ones, too. The 2014 bill? Elton John, Frank Ocean, Derek Trucks, Lionel Richie, Wiz Khalifa, Kanye West, the Lone Bellow, St. Paul and the Broken Bones -- and the list goes on. Firefly Music Festival, June 19-22: Dover, Del. 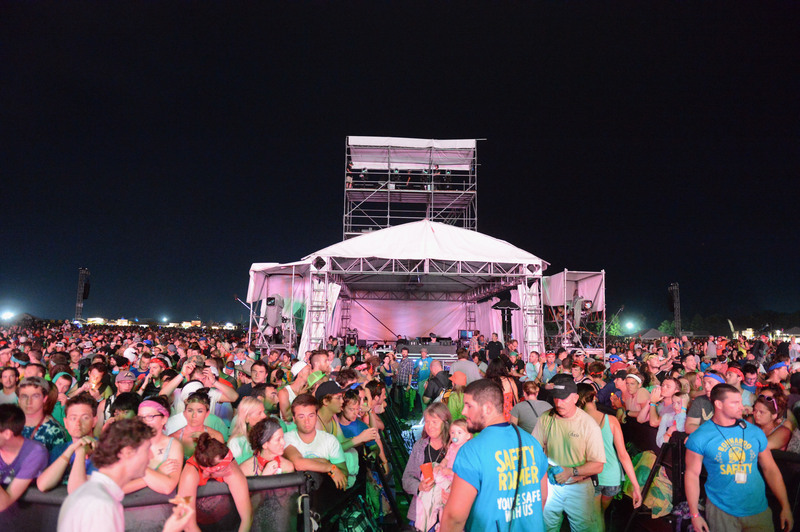 Launched in 2012, the now-annual Firefly Music Festival, tucked away in Delaware, continues to grow with Foo Fighters, Imagine Dragons, Weezer, the Lumineers, Iron and Wine, Chance the Rapper, Sleigh Bells, Ghost Beach -- and even Third Eye Blind (remember them?) taking the stage this year. Certified "The World's Largest Music Festival" by Guinness World Records, Summerfest takes place over two weekends featuring some 800 acts. Lady Gaga, Bruno Mars, Brad Paisley, Luke Bryan and Outkast are among the performers on tap for weekend 1, while the second weekend will boast big names, including Dave Matthews Band, Zac Brown Band, Motley Crue and Usher. Since 2006, Pitchfork has expanded on its music site by staging a festival showcasing artists from all genres. This year is no different. Fans can expect music from Beck, Kendrick Lamar, St. Vincent, Death Grips, Grimes and others. Forecastle Festival, July 18-20: Louisville, Ky. This three-day festival, which kicked off in 2002, began with local musicians performing at Tyler Park, later expanding to Louisville Waterfront Park. Gary Clark Jr., Spoon, Dwight Yokam, St. Lucia, Outkast, the Black Lips and more are slated to perform. Newport Folk Festival, July 25-28: Newport, R.I.
First held in 1959, the Newport Folk Festival is still going strong, and this year will be all the more memorable following the recent death of folk legend Pete Seeger, who was on the festival's original board. So, we predicts many Seeger tributes in July. The lineup is slowly trickling out: Jeff Tweedy, Ryan Adams, Nickel Creek, Mavis Staples, Band of Horses, Deer Tick, Jimmy Cliff and Dawes will all bring their brand of "folk" to the quaint town that weekend. No longer a traveling festival (the last time we saw Lolla in that form Metallica headlined -- that was ahem...1996), Lollapalooza is now held over one weekend in Chicago (since 2005). And as always, Grant Park will be jam-packed with both well-known and up-and-coming acts. Eminem, Kings of Leon, Skrillex, Calvin Harris, Lorde, the Avett Brothers, Zedd, Interpol and Arctic Monkeys are all on board this time around. Golden Gate State Park is currently home to the annual Outside Lands Festival (already sold out), which got its start in 2008. The bill this year features Tom Petty & the Heartbreakers, the Killers, Tiesto, Macklemore & Ryan Lewis, Ray Lamontagne, Tegan and Sara, Chromeo, Capital Cities, John Butler Trio and Haim. Randall's Island will once again play host to Electric Zoo, the annual electronic music fest held over Labor Day weekend. In 2013, the event was plagued by deaths linked to drug use, prompting the cancellation of the festival's final day. The show will go on this year. Electric Zoo's website notes the fest "has a zero tolerance policy for the use of illegal drugs. This policy will be strictly enforced." Performers will include David Guetta, Dada Life, Nicky Romero, Armin Van Buren, Kaskade, Zedd and countless others. Jay Z, Made in America festival founder, is ramping up his game this year by hosting his music fest in two cities on the same weekend -- Philly and L.A. The Philadelphia bill will include Kanye West, Kings of Leon, The National, Pharrell Williams, City and Colour, Mayer Hawthorne, and more. Los Angeles will include Imagine Dragons, John Mayer, Steve Aoki, Juanes, Afrojack, Kendrick Lamar and many additional acts. The question is: Which city will Jay Z and Beyonce make an appearance at? And just when you thought summer was over, Austin pulls out yet another music festival to keep the spirit going into the fall. One of the country's biggest music towns hosts a two-weekend festival in October; this year's bill will feature Pearl Jam, Calvin Harris, the Avett Brothers, Iggy Azalea, Icona Pop, Broken Bells, plus many others. Tell us: Which festival(s) are you checking out?